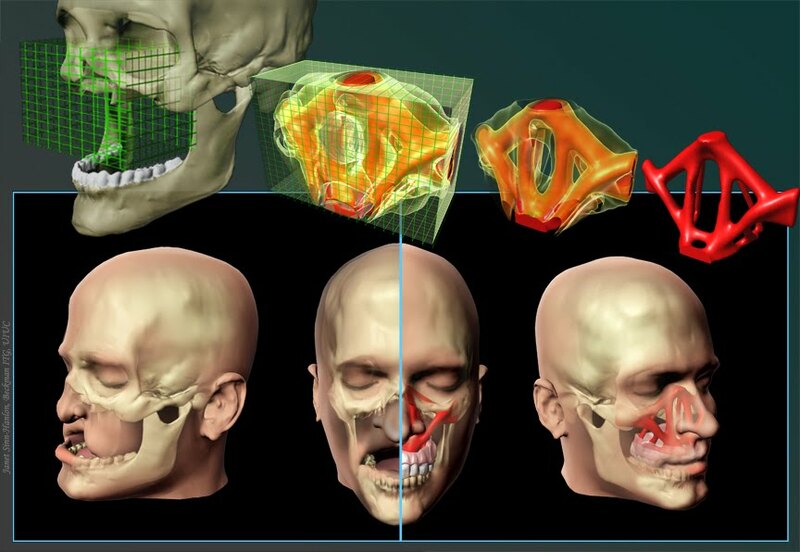 Facial reconstruction patients may soon have the option of custom-made bone replacements optimized for both form and function, thanks to researchers at the University of Illinois and the Ohio State University Medical Center. Whether resulting from illness or injury, loss of facial bones poses problems for reconstructive surgeons beyond cosmetic implications: The patient’s chewing, swallowing, speaking or even breathing abilities may be impaired. To fashion bone replacements, surgeons often will harvest bone from elsewhere in the patient’s body – the shoulder blade or hip, for example – and manually fashion it into something resembling the missing skull portion. However, since other bones are very different from facial bones in structure, patients may still suffer impaired function or cosmetic distortion. The interdisciplinary research team, whose research results were published in the July 12 edition of the Proceedings of the National Academy of Sciences, applied an engineering design technique called topology optimization. The approach uses extensive 3-D modeling to design structures that need to support specific loads in a confined space, and is often used to engineer high-rise buildings, car parts and other structures. Topology optimization would create patient-specific, case-by-case designs for tissue-engineered bone replacements. First, the researchers construct a detailed 3-D computer model of the patient in question and specify a design domain based on the injury and missing bone parts. Then a series of algorithms creates a customized, optimized structure, accounting for variables including blood flow, sinus cavities, chewing forces and soft tissue support, among other considerations. The researchers can then model the process of inserting the replacement bone into the patient and how the patient would look. The process is illustrated in this video. “Ideally, it would allow the physician to explore surgical alternatives and to design patient-specific bone replacement. Each patient’s bone replacement designs are tailored for their missing volume and functional requirements,” Paulino said. Now that they have demonstrated the concept successfully by modeling several different types of facial bone replacements, the researchers hope to work toward developing scaffolds for tissue engineering so that their designs could be translated to actual bones. They also hope to explore further surgical possibilities for their method.